This charm shows a rising sun half-obscured by the horizon. 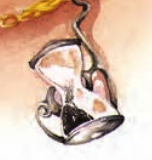 Like other chronocharms, this item slows your perception of time for a specific, singular purpose. When you activate a chronocharm of the horizon walker, you can move up to half your speed as part of the same swift action used to activate it; this movement does not provoke attacks of opportunity. When determining the distance you can move, round down to the nearest 5-foot increment. This ability functions once per day.